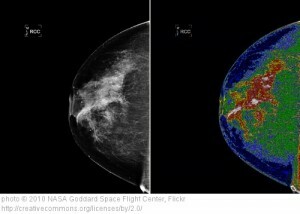 The most common imaging test for breast cancer detection is the mammogram, but it’s not the only one. A mammogram is an X-ray photo of the breasts. Just as you can see the shadow of your hand on a sunny day, breast tissue creates a shadow on the X-ray. Just as you can make complicated shadows by turning your hand or overlapping both hands, so can tissue from different parts of the breast overlap in the projections to make the x-ray hard to interpret. Taking two pictures from different angles eliminates some of the problems. Some cancers may not be visible on the mammogram. This is called a “false negative”. Normal tissue may look suspicious on an X-ray, but turn out not to be cancer. The rate of such false alarms (false positives) is so high that about 95% of women who have an abnormal screening mammogram result do not have cancer. O.K., so what does this all cost? Medical practices set their list prices based on normal business concerns such as staff costs, facility costs, etc. Medicare reimbursement rates (what the government pays for Medicare recipients) are the closest thing to a fixed or benchmark price in this marketplace. They have long been thought to constitute the low end of reimbursement rates from all payers (government, private insurers, military insurers like Tricare, Medicaid and others). Increasingly, though, we are hearing of private insurers that undercut the Medicare rates.